A hopeful couple obtain a dream house to die for in Radiant Vermin. In Radiant Vermin, a young couple, Jill (Kelly Godell) and Ollie (Chris Murray), are given the opportunity to become homeowners—for free. It's a crappy house, and it's in a bad neighborhood, but it's theirs to turn into the home of their dreams. In return, they must simply become the first gentrifiers—move in and raise the property values enough to attract more people like them. "All it needs is for one house to sparkle," says Miss Dee (Diane Kondrat), the mysterious woman who recruits them and works for a government agency suspiciously named the Department of Social Regeneration Through the Creation of Dream Homes. Early on in Radiant Vermin, the mechanism through which the renovations take place is revealed. When Jill and Ollie are spending one of their first nights in their new house, they hear noises coming from downstairs. Ollie goes to the kitchen to investigate, where he's ambushed by a homeless person. In the struggle to defend himself, he accidentally kills the intruder. Sixty-six seconds later, a bright supernatural glow begins emanating from the body before it disappears. In its place is a beautifully improved kitchen, which has been magically updated with top-of-the-line fixtures and appliances. "You killed a vagrant and he's been reincarnated as a designer kitchen?" Jill asks, taken aback more than anything. His droll reply: "Isn't that clearly what happened?" This deadly calculus understood, much of the rest of the play becomes about how the couple can continue refurbishing the house—quickly, and without attracting attention. Radiant Vermin is told in a collaborative, conversational style. It's a bit like being at a cocktail party listening to the couple reminisce about what happened. Jill and Ollie go back and forth propelling the story and elaborating on each other's details. 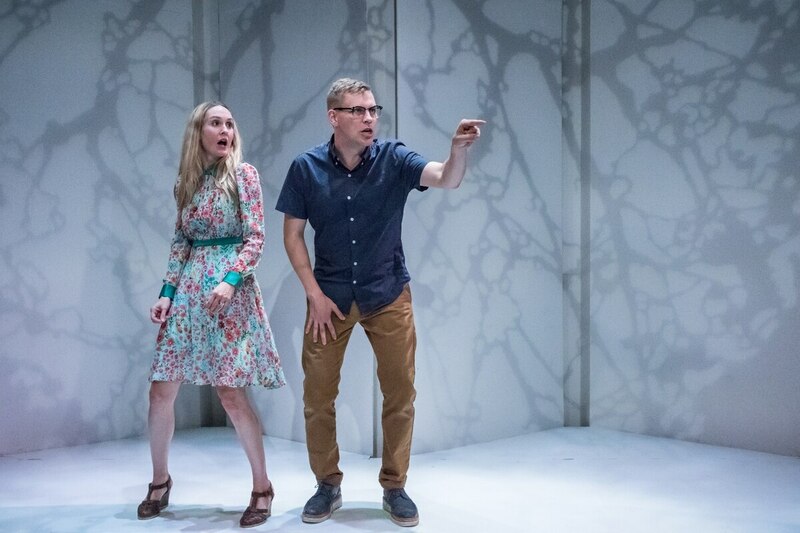 Godell and Murray display strong chemistry and remain up to the difficult task of matching playwright Philip Ridley's sometimes madcap pacing. The highlight of the play is a darkly humorous scene between Jill and a homeless woman (also played by Kondrat) whom she's brought home to "help" with the renovations. When the homeless woman figures out her grim fate, rather than trying to flee or fight back, she considers and admits, "I want to be part of your home," then breaks down crying. "To have such a purpose," the homeless woman says. "Bless you." While the journey of Radiant Vermin does have its share of laughs and tidbits of scathing commentary, ultimately it feels like Ridley didn't have a destination in mind. Aside from the scene with the homeless woman, the perspective feels flat. Much of what we see is merely Jill and Ollie following through with their nefarious plan. It's an entertaining note, but it's still just one note. The climax of the production is supposed to be a boundless, breathless garden party scene in which Godell and Murray play all of the guests, in addition to Jill and Ollie, jumping from character to character and voice to voice. The scene doesn't pay off thematically, and rather than being funny and exhilarating it's muddled and tiring. Satire is personal, and although Radiant Vermin was not a total success for me, others may find it subtle and effective. There is no question that the issue it targets, gentrification, is relevant in a constantly changing Portland—a predominantly white city with a history of pushing out marginalized communities so that it conforms to certain tastes. SEE IT: Radiant Vermin plays at CoHo Theatre, 2257 NW Raleigh St., cohoproductions.org. 7:30 pm Thursday-Saturday, 2 pm Sunday, through Sept. 29. $25-$32.